Last night I did something I haven't done in about 20 years. In bed, I put on my headphones, pressed the play button on my old Sony Walkman and listened to one of my 200 live tapes, a cassette containing an audience recording of an Elvis concert. This brought back a lot of memories, I can tell you that. I remembered looking at the long type written list with concerts, painstakingly picking the ones to buy, and also the excitement when the cassettes finally arrived. But most of all I remembered listening to the tapes, often in bed with my headphones on, imagining I was right there in the auditorium, watching Elvis perform. Sometimes this called for a lot of concentration as well as imagination, as the sound quality was really bad. But the longer I listened to a tape, the more I got used to the sound and the more I got out of the experience. 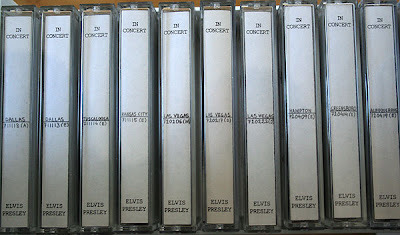 Thanks to those tapes I learned a lot about Elvis' concert career; after all RCA only released a couple of live albums during his lifetime, and he did over 1 100 shows. Nowadays it's a different story altogether, with all the soundboards being released, both by FTD and the bootleggers. But just as the live tapes taught me a lot, so have the soundboards. You see, because the sound was so bad at times on the live tapes, I thought Elvis sounded great all the time. The soundboards paint a different picture. Now I can clearly hear what was going on. One such example is the closing show in Las Vegas on September 3, 1973, released by FTD in 2004 (Closing Night). When I listened to this one on cassette I thought it was a great show with Elvis in fine form vocally. The soundboard, on the other hand, tells the story about a crazy show, where Elvis changes a lot of the lyrics and where his mode swings from funny to angry and back again. The soundboard also reveals that Elvis' voice seems to have lost some of its power, and that the songs, with a few exceptions, suffer from this. On the other hand a soundboard can confirm a first impression. Yesterday I listened to Elvis' evening performance in Dallas, November 13, 1971. Although the sound quality was really bad I thought it was an exciting concert with Elvis in fine form and mood. Today, I played the soundboard CD The Power Of Shazam, and though it was recorded in Boston three days earlier it confirmed my belief that this, Elvis' third tour, was a great one. PS: You can read the first part about my Elvis cassettes here.